Dark Social Sharing Is Out Of Control! 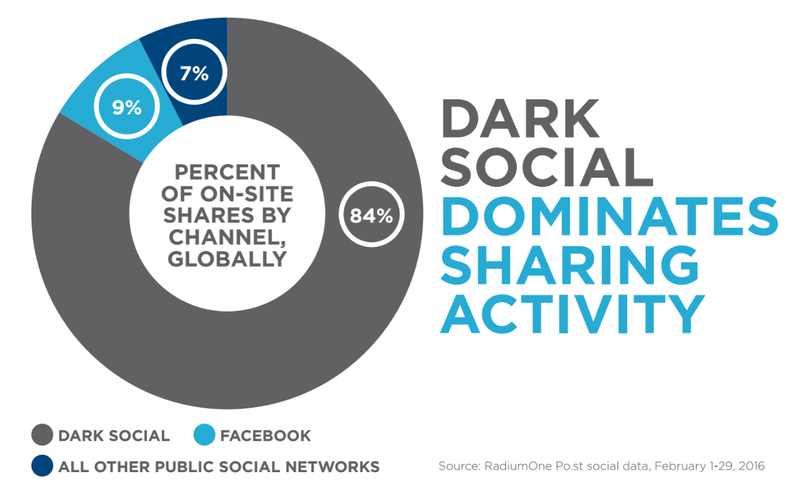 According to the study, Dark Social shares as a percent of on-site shares rose from 69% to 84% globally since December 2014 when RadiumOne released its original Dark Social report. Dark Social shares happen mostly on mobile devices which makes sense since that’s where most messaging happens. Clickbacks of Dark Social shares come 62% from mobile and 38% from desktop computers. In December 2014 Mobile accounted for 53% of clickbacks, following the overall trend of increased internet activity via mobile devices. The study notes that that it is worth taking the effort to convert Dark Social activity into a marketing opportunity. RadiumOne provided an example of a luxury retailer that captured Dark Social activity on website and then used that data to inform paid media and, “As a result, the retailer tripled its site traffic and beat its CPA goal by 71%.” RadiumOne offers sharing software which helps capture the Dark Social marketing opportunities. With the right software can gather and activate Dark Social data on your behalf, every time visitors to your owned media assets share your content or links into private messages. These tools also ensure that your Dark Social data is rich with intent by capturing information about how audiences respond to the content that has been shared with them. In addition, since Dark Social shares are personalized to the recipient, Dark Social data provides an accurate representation of consumers’ interests and intent, and the ability to target a highly qualified and intimate network of connections. This representation makes it worthwhile to harness Dark Social on owned and earned media because it can be used together with data-driven media buying to capture the attention of consumers at just the right moment in their increasingly complex consumer journeys.